One of the best things about running is just how little is required in order to do it. A pair of shoes (or not, if you’re hard), some clothes, and a patch of real estate are really all you need. Unlike some of my other pursuits, with about a hundred bucks or less you can participate. Of course, there’s always room for more gadgets, tools, specialized clothing, etc…but they’re all optional. You don’t need to drop a minimum of 750 to a grand on a lift ticket/board/bindings/boots/gear like snowboarding. The resources required to run are precious little. Shoes…if the picture above doesn’t say “fetish,” I don’t know what does. There’s been a lot of talk over the past couple of years about minimalism. If you’re not aware, the shoe industry over the past 20 years has produced ever-increasingly over-engineered products. What began as a means of correcting biomechanical issues and offering more cushioning turned into production of $150 running shoes that looked more like NASA-produced moon boots than means of efficient movement. Recently, though, demand has turned away from these big clunky monsters, and more towards shoes that allow natural movement and muscle response i.e. “minimal” shoes. The evidence to support minimalism is still outstanding, Some say it’s better for you, while some say it’s dangerous. I‘m no scientist. I can tell you that personally, running in minimal shoes has always felt better for me, and my policy is that everyone should be running in as little shoe as possible. Minimal shoes are characterized by varying lightness and degrees of heel-toe drop in the midsole. While non-minimal shoes run an excess of 10-12 oz a shoe, and 10-15mm of heel-toe drop (think of a down-sloping ramp due to there being more cushioning in the heel than in the forefoot), most minimal shoes start around 9 oz or less, and offer anywhere between 0-9mm of heel-toe drop. The heel-toe drop thing is important because the less gradient there is, the easier it is for you to foot strike in your stride midfoot/forefoot. Anyway, the shoes you see above run from less to more minimal from left to right. The Brooks Launch are the shoes I wear when I feel pretty beat up, sore calves, achilles, etc. The next two, The Mizuno Wave Musha 2, and the Saucony Kinvara are my workhorse shoes. I do most of my regular runs in them. The Saucony Grid A4 are next – those are my speed work/racing flats. Both the Kinvara and the A4 run a 4mm heel-toe drop, and are both very light. 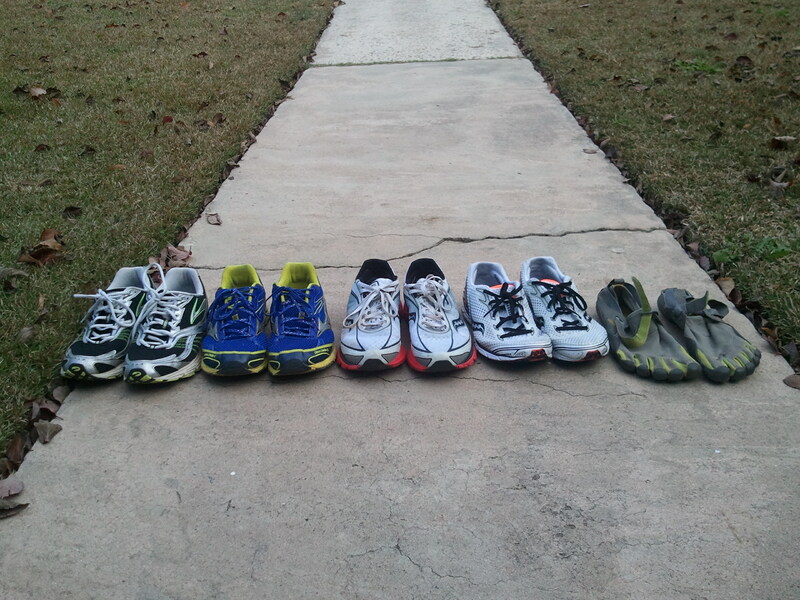 Last on the right are my Vibram Five Fingers, which are as close to barefoot as you can get. They’re basically slippers with articulated toes. I do all my strength work in them, and try to do a couple 3-5M runs a week wearing them. Other gear: My favorite socks are Smartwool, and my favorite shorts are shorty shorts, preferably the ones with split legs. Yep, they may offend your sense of decency but on the back half of a hot track session that last thing I care about is your fashion sense. My favorite shirt the one I leave at home so I can run shirtless in hairy-chested manliness. My sense of minimalism clearly extends beyond my shoe selection, as you can see. The last piece of gear I will mention is my watch. I use the Garmin Forerunner 305, and that enormous hunk of wrist candy is an homage to my nerdy desire for accurate data. If I have a crutch, my 305 is it. I get all twitchy when I forget it, or the battery dies, or it’s acting up. The latest in the fight against the Taliban...the BA-K-47. 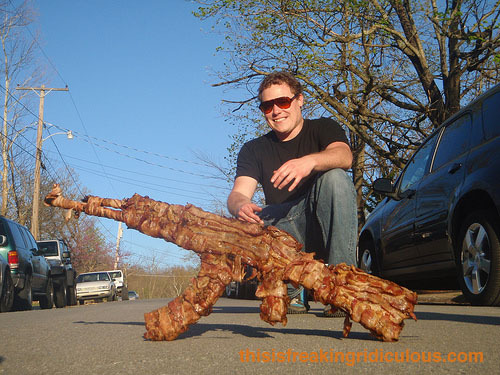 I would eat that weapon. So, I checked out this Zone Diet thing, which essentially re-apportions your food like this: 30% carbs/30% protein and fat/30% fiber. Additionally, it recommends cutting as much processed food and especially processed carbs out of your diet as possible. I ran with it, and so far the results have been good. I’m not fascist about it; I simply try to stick to the ratios. We also stick to organic and minimally-processed as much as possible. When I started, I was around 190 – since then I’ve dropped to 170-175 on average. My fueling issues are virtually non-existent. Where I used to have to take in a gel or some kind of caloric intake at least once or twice in a longer workout, I can now do 20-24M only taking on water and electrolytes. I probably go overboard on the protein and fat (1lb of bacon and a dozen eggs a week are nothing) and if I want to lose any more weight I’m going to shift to leaner meats and the “good” fats (nuts, olive oil, salmon, etc). As far as running-specific nutrition, I use Endurance First Sports Ultragen mix as a recovery drink, and for gels I use Accelgels since they have protein and the caffeinated Powergels for those late-race boosts. Propel is my drink mix of choice for both hydration during the day as well as during training. Who doesn't like a good kick in the junk? which helps move good stuff in and bad stuff out). In college, I took an ice bath every day, and when the runners showed up to the training room, the ball players and other athletes took off since they knew we were going to turn the cold bath Arctic by dumping a ton of ice in. These days, I have less of a tolerance for 37 degree baths, as evidenced by the photo on the right, but I’ve always heard the 50 degrees or so is about what you need to max out the effects. 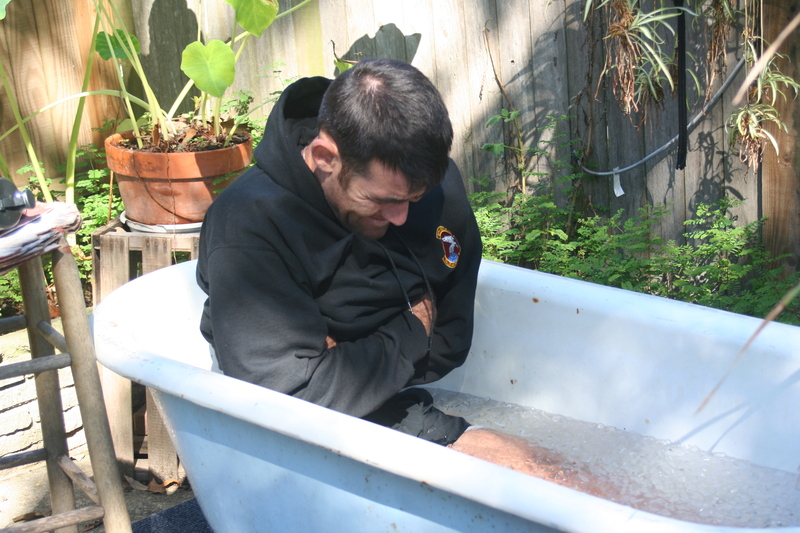 Just don’t try telling Whitis that…that’s his Dr Torquemada take on an ice bath I’m grimacing my way through in the picture. The last recovery aids I will mention are compression socks/sleeves. Long in use by medical patients with lower leg circulation issues, they’ve come into vogue in the endurance scene in the past couple of years. The theory is that by constricting the blood vessels in the legs, they force more blood through and do the whole good stuff in/bad stuff out thing while you wear them. I use them after long runs or workouts, and now every time I fly to help minimize the amount of blood pooling in my legs during yet another cattle-car ride. That’s about it for today…now you know I’m a hairy, bare-chested minimalist who sleeps too little, can’t handle ice baths, and wears funny calf sleeves. Check back tomorrow for my thoughts on the concept of recovery. On a more positive note (compared to my previous comment), we’re enjoying your 7 for 7 series.